Think thick when it comes to coat. 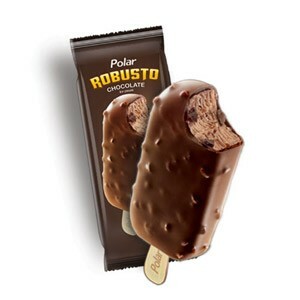 Thick chocolate coated Ice Cream Robusto is indeed a treat to remember. A treat that does not want to end as you go on having it. Ingradiants: Milk solids (SMP,FCMP), Milk Fat, Vegetable fat, Sugar, Liquid Glucose, Stabilizer, Emulsifier, Milk chocolate, Cocoa Powder, Food Flavor and Color, Real Chocolate coating with Crunch, and Water.